A pet peeve of mine (don’t get me started on the others, because there are many!) is when I’m reading an enticing food idea or recipe that makes a useful/practical/tasty suggestion – and then completely fails to tell you any further details. A favourite example (where favourite = sends me into a teeth-gnashing froth of outrage) would be the suggestion for leftover roast chicken, which ‘helpfully’ suggests using it as a basis for other meals – and then leaves it at that. Erm, hello? Exqueeze me? *taptap* WHAT other meals? Just HOW do you expect me to use it?? You can almost see the airy, vague wave of the hand. So when I started this blog, I decided that I would never suggest any additional items to an ingredients list without having previously including at least one recipe. It’s not something that has featured heavily in the recipe selections here yet, so it might have gone unnoticed, but an example would be the Pulled Pork Sandwich. I made the serving suggestion of including Barbecue Sauce and Coleslaw – and serving it in a Tiger Bread Roll – recipes which could be found on the blog. All of which is a long and rambling preamble as to why this recipe is going up today. This week I happened to mention on Twitter that I had made some fat-free mincemeat with no added sugar, wondering if anyone would be interested. From the responses, people certainly were interested, so with the festive season approaching, a post about sugar-free, fat-free mincemeat should be popular. ‘Still not explaining the candied peel recipe’ I hear you mutter. So here’s the thing. The mincemeat recipe I put together uses home-made candied peel. ‘Whaaaaaaaat?? But I can buy that!’ you shriek. Yes, I know. 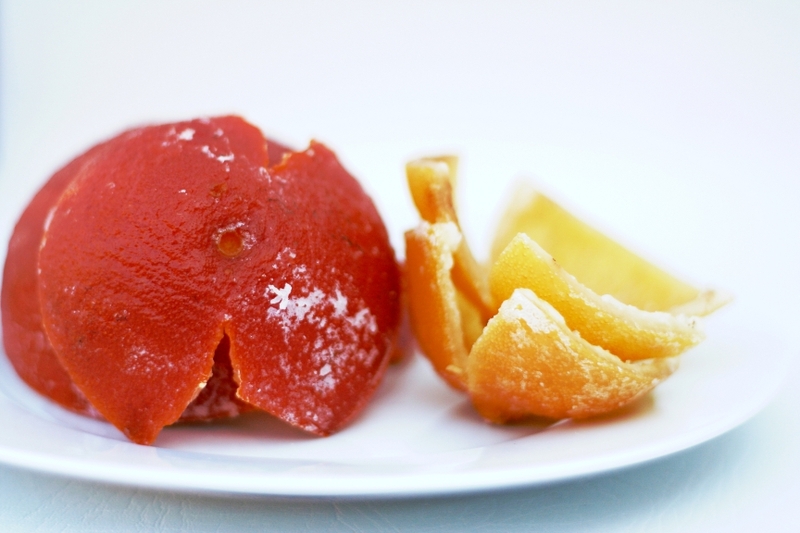 But if you’ve ever tasted fresh candied peel made with nothing more than sugar, peel and water – you’d understand. I used to hate store-bought candied peel, and avoided anything that included it, but home-made just blows it out of the water. The explosion of citrus flavour is amazing. The beauty of making it yourself is that you can candy any citrus peel you like, and not be limited to just orange and lemon. So here, for anyone who fancies having a go, is how to do it. It’s not difficult or complicated, but it is a bit repetitive. But make a decent amount at one time, and you won’t have to repeat it for a good few months. Oh – and it’ll make your house smell amazing. Bring water to a boil and boil for a minute or two then drain. Rinse the peel thoroughly, and also scrub the sides of the saucepan thoroughly as well. Why? The bitterness of the peel comes from the citrus oil in the skin of the fruit. Bringing the water to the boil helps release this oil, but it then floats on the top of the water, coats the rind when the water is poured off, and also congeals onto the sides of the pan. If you don’t rinse the peel and scrub the pan well, you just end up basically boiling the peel in the bitter citrus oil, which kinda defeats the whole purpose of repeated boilings. Since taking the photo to go with this post, I have tweaked the recipe instructions in order to make the candied peel easier to make, store and use. You can of course, keep the peels in large pieces if you prefer. Testing whether the fruit is tender is trickier with larger pieces of peel, so why not try this tip I picked up from an 18th century cook book: the peel is soft enough when the stem of a clove can easily be pushed through it. Does this mean I now have a use for all the orange peels from the mountain of fruit my children eat?! Hi Mary-Anne! I made this following your instructions and the result was very, very delicious!! However, i used this in a fruit cake but the pieces of candied peel turned hard and/or chewy. Do you know why, and how to avoid this in future? If this problem can be solved , I shall never buy any candied peel anymore. Hello, what a fabulous recipe! I have made the candied peel with the intention of using it for the veggie/vegan mincemeat recipe, which I will do when I have a spare evening over the next week or so. I made it! It’s so delicious I could eat it out of the jar. I don’t know if any will survive long enough to make it to mincemeat, much less mince pies. That said, I have been yearning for an old-fashioned boiled fruitcake lately. I hunted through my recipe books this morning looking for candied peel recipes because I wanted to make your mincemeat. Naturally I should have saved myself the time and come straight to you. You never disappoint! Looking forward to giving both a go. In your mincemeat recipe you say it only lasts a week. I have a similar recipe from a Kiwi cookbook (with different proportions and spices) which lasted quite well over a few months. Are you hedging your bets or are fruits & etc. in the U.K. subjected to more vigorous bacteria? After all is said and done and the fruit is used up from the jar it’s stored in; instead of using the syrup to drizzle on something, can I use it to cook the same kind of peel again? I hear you – and it’s something that I wondered too, but I’ll save you the time and effort – because it wasn’t a success. The syrup lost it’s fresh flavour and ended up tasting of dull, overcooked marmalade. If you can gauge the quantities, so that your cooking syrup is almost all absorbed by the time the peel is tender, then you could re-use the syrup left over from the previous batch for storing, but a second cooking is definitely out, if you want to preserve the fresh flavour. Thanks for the info on reusing the stored syrup to cook with AND your prompt reply! Will certainly follow your instructions. This will be my first attempt at making mince meat pie totally from scratch.